Beautifully designed this maroon colour appealing kamar-patta embedded with sparkling stones is best pick for modern women like you. It is made from golden finish metal and ensures high durability. 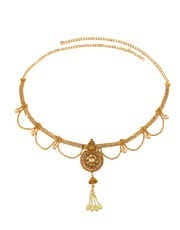 It has pearl beaded string with golden droplet for added attraction. This waist chain will fetch you lots of compliment from onlookers for your amazing choice. So order now! 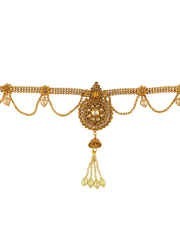 Visit Anuradha Art Jewellery now to shop for Kamar Patta and Waist Chain for women.